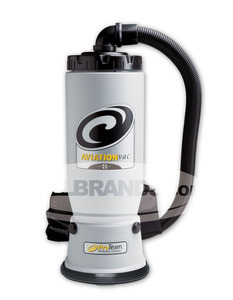 Designed exclusively for the airline industry, the ProTeam AviationVac Backpack Vacuum Cleaner utilizes the same 400 Hz power system used on airplanes without the need for bulky adaptors. The lightweight wand and ergonomic backplate provides a highly efficient tool for cleaning up in a hurry. The ProTeam AviationVac Backpack Vacuum Cleaner features ProTeam's unique Four-Level Filtration system that captures tiny dust mites, bacteria and floating particles - particles that create unhealthy air. ProTeam's unique method of suction vacuuming cleans carpets, hard floors and other surfaces without stirring up dust - so the air stays cleaner, the furniture collects less dust and operators clean without breathing unhealthy air. Micro Filter : 496 sq. in. Includes: 1 1/2" static dissipating vacuum hose, 50' extension cord, and two Intercept Micro Filters. Warranty: 3 year parts, labor and motor and life on the molded body parts.